ARLINGTON, Texas — On the second play from scrimmage, Amari Cooper caught his first pass with the Dallas Cowboys for an 11-yard gain, leading the fans to yell, “Coooooop.” By the end of the third quarter, the “Coooop” had turned to boos. To come up empty at AT&T Stadium, where they had been perfect thus far this season, can be viewed only as deflating. With eight games left the Cowboys still have a mathematical chance to win the NFC East or earn a wild-card bid, but all of their faults were on display against the Titans. 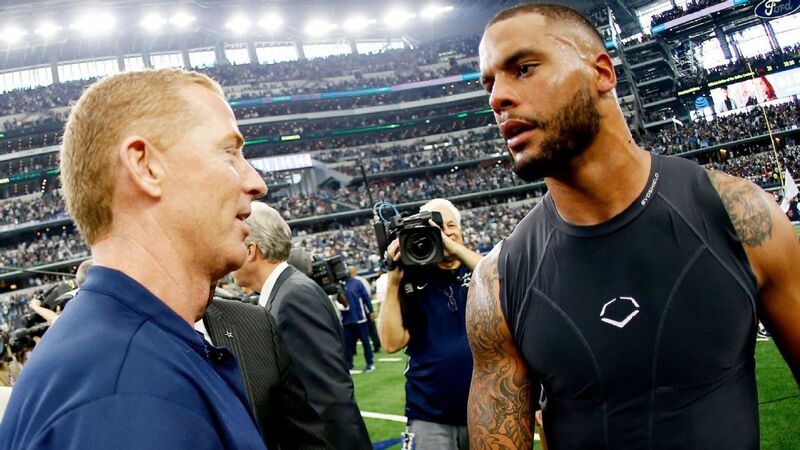 “When you’ve played eight games and only won three, that’s a cause for concern,” said owner and general manager Jerry Jones, who added there is no scenario in which he would make an in-season head coaching change with Jason Garrett. The Titans answered with a 15-play, 80-yard drive to tie the game. On the Cowboys’ first possession of the second half, Prescott was sacked by Jayon Brown and fumbled. Wesley Woodyard recovered, and like the Titans did after Prescott’s first turnover, they turned it into a touchdown for a 21-14 lead. A Cowboys defense that started fast wilted. Dallas allowed touchdown drives of 80 and 69 yards in the first half and saw Marcus Mariota do to them what the Cowboys want Prescott to do. The Titans converted 11 of 14 third-down tries. Mariota was methodical in the passing game (21 of 29, 240 yards, two touchdowns) and ended the Cowboys’ chances with a 9-yard touchdown run with 4 minutes, 38 seconds to play. With road games coming up against the Philadelphia Eagles, who are coming off their bye week, and the Atlanta Falcons, who have won three in a row, the Cowboys find themselves with their season the line. Oh, the Cowboys are winless away from home, matching the loss total (four) they had away from home in Prescott’s first two seasons as the starter. For Prescott and Jason Garrett, more than the season might be on the line. Their futures — short- and long-term — are on the line.